Published: Dec. 9, 2018 at 02:38 p.m. 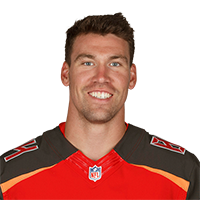 Published: Nov. 25, 2018 at 01:31 p.m.
Tampa Bay Buccaneers tight end Cameron Brate fights through a defender to score a 15-yard touchdown. Published: Sept. 30, 2018 at 03:47 p.m.
Tampa Bay Buccaneers quarterback Jameis Winston throws a 16-yard touchdown pass to Cameron Brate, who holds on after heavy contact.